Posting about non-horsey things is not something I do often, but you deserve an update from my depression post after all of the kind words and suggestions you offered. You ended up making the difference, since you were the ones that suggested taking Vitamin D.
Since that post, I've started taking a 1000 IU Vitamin D pill every morning and using a SAD lightbox for 30 minutes every morning. I also found out that up to 50% of women in an irregular time zone area, (where the time and the sun are not really normalized with a daily American schedule - includes most of Indiana), have Seasonal Affectivity Disorder, and that a huge percentage of Americans have a Vitamin D deficiency due to not enough outside time year-round. Who knew? - The day I started taking Vitamin D was the first day I didn't cry in several weeks. - The one day I forgot to take Vitamin D since then, I freaked out, panicked, cried and snapped at my co-worker over a minor work crisis that was resolved in minutes. - I am constantly so happy after I started taking it, and find it easier to deal with life. - The lightbox makes me feel alert, like I've had coffee before I've had coffee in the mornings. So, for me, Vitamin D = happy pills, lightbox = energy. (Also, the Vitamin D was $2.99 for a 3 month supply, so it's cheap and effective!) The change in the way I feel is so dramatic - from not being able to find the joy in anything and crying every day, to running around the house singing at the top of my lungs and chasing the dogs on a regular basis (sorry, dogs) because I just can't contain it. No exaggeration! I hope this helps someone. Thank you all again! Maybe I should bump my dose! I really do like it. Good, I'm so glad it helped someone! It's so cheap, and makes such a big difference. Glad the the Vitamin D is working! I know it really helped me a couple years ago. Happy to hear you doing better. It was $75, and I hesitated to pay that too but I'm glad I did. It's got LED lights so the bulbs won't need replaced much, and it has a nice timer feature, so it turns off when you've reached the recommended amount. The one I got was off-brand, the name brand ones like Phillips are in the $120-$150 range. Just realized I only answered half of your question! 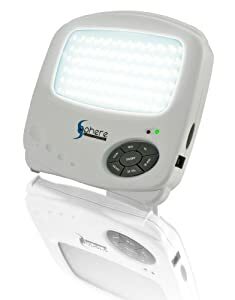 It's the Lightphoria 10,000LUX Energy Light Lamp, http://www.amazon.com/Lightphoria-000LUX-Energy-Light-Lamp/dp/B004JF3G08. I figured, 4.5 stars after 545 reviews, has to be pretty good, right? I absolutely love my lightbox! Although, yours looks way more portable than mine. I also take a daily multi-vitamin, but I could probably use a booster of vit D.
I am lucky enough to work a flex schedule, so I have the option (and use it!) to come in at 6am and leave at 2:30 pm, so I have some daylight in my afternoon hours! My friends and family notice a distinct 'wilting' in my demeanor if the sun hasn't been out in several days. I am definitely a solar-powered woman!! Mine is definitely designed to be portable, it comes with a little travel bag. I really like it, if you're looking for one that goes with you. They also make a kind that sit on your computer monitor, just a little lightbar, I've looked at that too since I work in the basement. Oh, that sounds great! I'm going to look for one of those computer monitor ones!! My husband put up a sewing space in the basement for me, but it's just too dark and dreary. I can't use it. I just can't stand the basement, even *WITH* my lightbox! Thanks so much for sharing! Happy to hear, I also started tanning which I actually hate doing, but the vitamin D really helps me in the winter also. This is great! What a fantastic result for you Jen! May you have many, many more Happy Lightbox days. I am so glad that you found a solution! I used a light box for one season. I felt super lethargic and then realized that I was not getting any sunlight (no windows in my room at work). It helped tremendously. I think I also took a vitamin B pill. So glad you updated on what is working for you! The whole lack of daylight makes sense.